Admit it or not, having fair and even skin tone adds up to our level of confidence when it comes to our physical appearance. The noticeable fair complexion, the supple moisture and healthy glowing skin – it’s like every girl’s dream indeed. Don’t let blemishes and uneven skin tone put you in a spot! With Elite Nails’ Illuminating Packages, you can now boost your skin care regime…so is your confidence level. 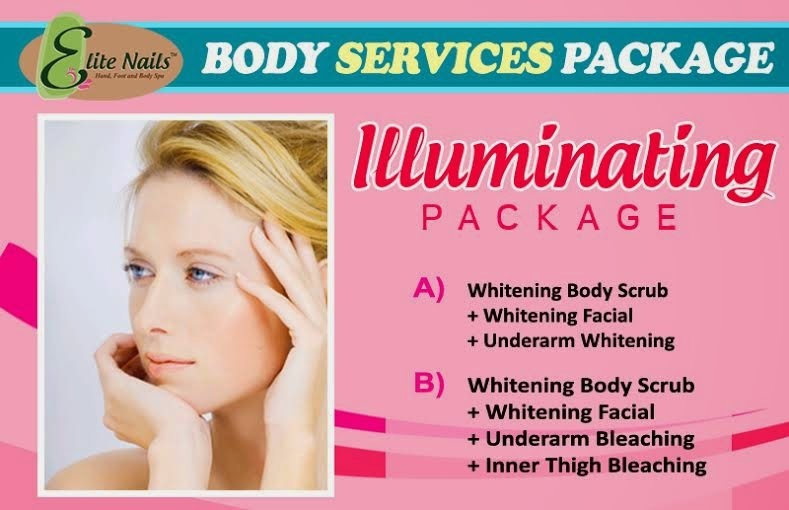 Package A includes a body scrub, facial and underarm treatment – all with whitening components. Enjoy this ultimate pampering experience with a promise of fair and healthy skin after each session. Package B features a complete whitening treat with body scrub, facial, and underarm and inner thigh bleaching treatments. Same with the first package, this is indeed a great deal and the most convenient and non-evasive treatment you’ll need to achieve healthier, whiter and rejuvenated skin.